We have a history of doing ridiculous things in the name of ice cream since childhood, right? There’s no life lesson quite like learning how to both chew gum aaaannd eat ice cream when you order Blue Bubble Gum Ice Cream (a flavor surely sent down from the heavens). I was also master of ordering a dish of ice cream, clenching my child-fist around my spoon and stirring my ice cream a perfect milkshake consistency. Knowing when to stop stirring is key and this definitely felt just like cooking to my child-brain. Ice cream is fun, with or without bubble gum. But really, the more playful the better because life is short and days are long and we need treats. I put cake in ice cream because it seemed like something I would have literally jumped up and down for 30 years ago. I jumped up and down having a scoop for lunch in my kitchen… because I’m grown now and ice cream can be breakfast lunch and dinner if I’m feelin’ it (and a belly ache). The Red Velvet cake is baked from a boxed cake mix. Gasp! I know. Guess what? It’s ok… like 100% ok. Cake mix is fantastic in this recipe because it’s easier (hallelujah) and the oil and sugar in cake mix makes this cake more freezer friendly so it’s not entirely crumbly and dry as it freezes into the ice cream. The cream cheese ice cream base is a simple combination of fatty and delicious dairy and comes together in a blender without having to cook egg yolks like a traditional ice cream base. As simple as I’m trying to make this… you’ll still need an actual ice cream maker. I have this higher end Breville ice cream machine which literally makes dreams come true. The more wallet friendly ice cream makers, like this work well too. Just remember to freeze the bowl overnight and after about 30 minutes of churning the ice cream, transfer it to a freezer safe container to freeze. I find that the freezer bowls only churn effectively for about 30 minutes, longer is just warming torture for the ice cream. Buy sugar cones at the grocery. Dig the sprinkles out of the cake decorating drawer. It’s a party no matter what. Nail art (I know… totally random) by: MAD Nails. This ice cream recipe is based on this little bit of ice cream genius: Blueberry Cheesecake Ice Cream. 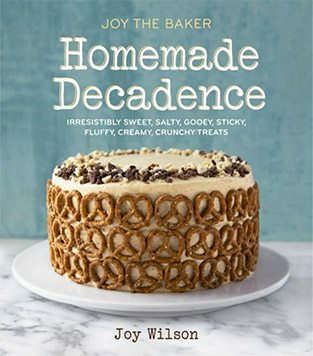 To make the ice cream, combine the cream cheese, milk, cream, sugar, salt, and bourbon (if using), in the bowl of a large food processor fitted with a blade attachment. Blend on high speed until smooth. Depending on how softened your cream cheese was, there may be a few flecks of cream cheese remaining in the combined mixture. That’s ok! Transfer the mixture to the bowl of an ice cream maker and churn according to the manufacturer’s instructions, usually about 30 to 45 minutes. After the ice cream is churned, please in a large freezer safe container and quickly stir large and small cake pieces into the ice cream. Cover with plastic wrap and freeze until firmed through, at least 4 hours. 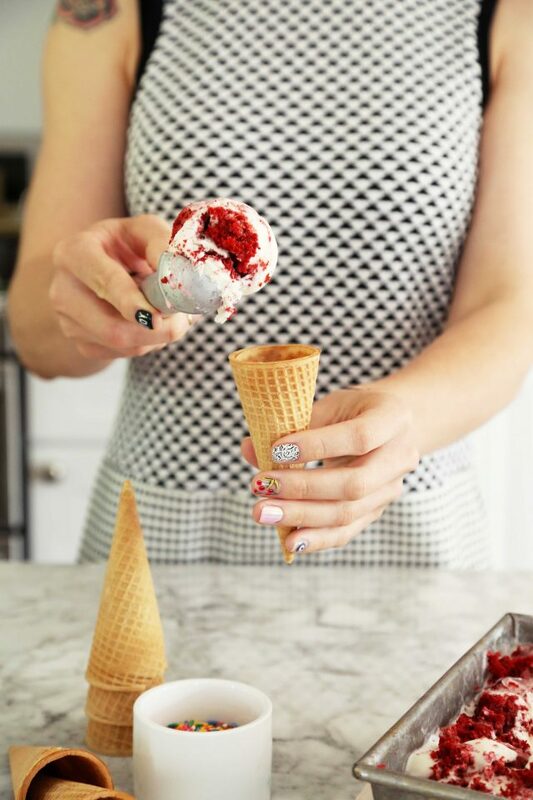 Scoop onto sugar cones and enjoy! Previous Post: « What Can We Do Better This Week? Must. Have. 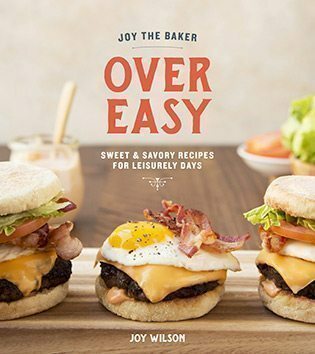 This looks amazing, Joy! Ice cream looks amazing but your dress is BEAUTIFUL!! Where is it from? the dress is an old gem from Stitch Fix. thank you!! Dying over this. Wish I had some right now!!!! Man do I want that ice cream maker. It’s been on my wish list for ages, but the price is just so hefty I would need to make sooo much ice cream to justify it. But this ice cream almost makes it seem worth it to just take the plunge! I hate having to pre-freeze a bowl. you’re right! it is a steep price for the better machine, but i will tell you… it’s a dramatic difference in the ice cream making experience if you do decide to take the plunge. First of all, your manicure is amazing!!! And this ice cream recipe definitely looks like a childhood dream come true! Cake and ice cream in one cone?! Yes, please! Love it! I remember that blue bubble gum ice cream! I miss that stuff. Wonder where I can get it. Just yesterday I picked up one of those Nestle ice cream sandwiches, the long rectangular ones with the vanilla ice cream and soft chocolate cookies, in the name of childhood nostalgia. 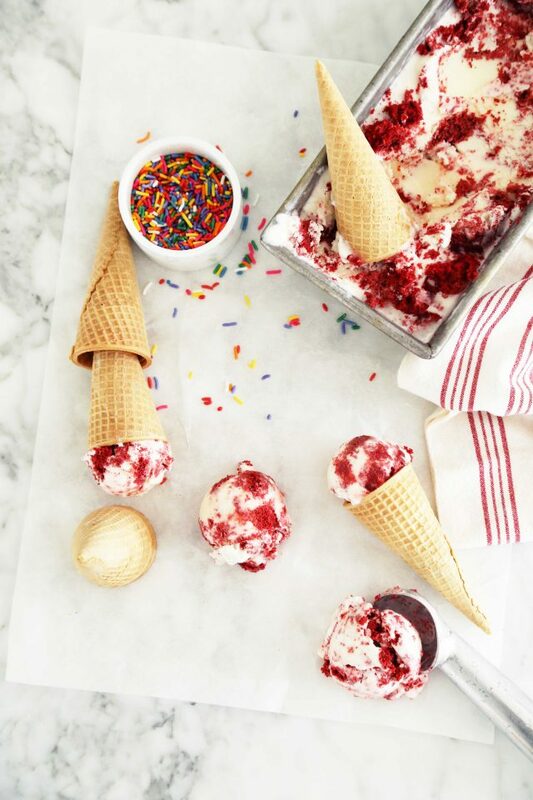 I’m definitely making this cream cheese + red velvet cake ice cream, because kid me’s favorite way to enjoy ice cream was with birthday cake, sometimes on the side and sometimes mashed together. I also bought an ice cream maker a few months ago and have had so much fun playing with it, it seems about time for a new flavor! Also, awesome nails! I was going to comment asking about them until I saw the link. Unfortunately way outside my radius, but great inspiration! Oh wow. I mean, really… WOW!! I LOVE this flavour Joy!! That red velvet is super bright! Years ago, I had leftover birthday cake and ice cream … my husband said that when he was a kid, his grandmother used to crumble leftover cake, brownies, cookies, etc. into ice cream so they never had plain ice cream when they visited. Yes … I crumbled the leftover birthday cake, frosting & all, into store-bought ice cream. YUM!! 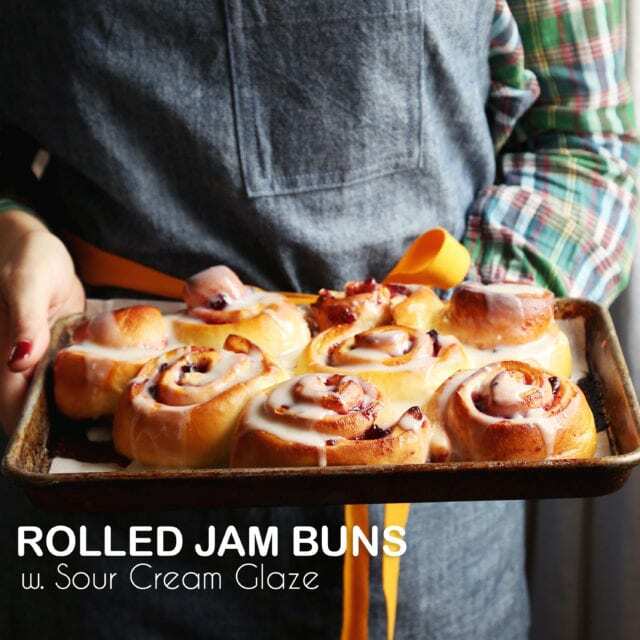 I can’t wait to try your version with this cream cheese based ice cream!! I am so into this! And finally–a reasonable excuse to use cake mix!!! Love your nails!! Suppose one wanted to make this vegan. Do you think I could sub coconut milk for both the whipping cream and whole milk? Wow. I need an ice cream maker STAT. Beautiful pictures! My mouth is watering!